Sunita Shrestha is a girl of 11 years who is studying in grade 3 at Krishna Mandir School. She lives with her Grandparents. Her mother passed away when she was small. Since she is not treated well by her father an step mother she prefers living with her grandparents and a younger brother. Sunita is a hard working student. Her grandmother owns a small food stall from where she earns around Rs 1300 per day. She loves her studies. In her leisure time she helps her granny to make cotton lights (batti). She is the first student to receive KG Awards in July. After receiving the awards she is more focused in her education. She express to KG volunteers that the Award has boosted her motivation in studies. Beside studies she loves music and singing. She dreams to be a good singer in future. The profile is created by Shristi Bhetwal and Reecha Nakarmi. Kripa Khanal joined KG in July. Since, managing volunteers has been one of the challenges in Sajha Khaja for KG we asked Kripa to help KG in delivering Sajha Khaja. Because, she doesn't posses vehicle and has problems commuting in public bus, she was little reluctant in the beginning Nevertheless, after delivering Sajha-Khaja for the first time she has been energetically volunteering for the program. Kripa travels from Lazimpat to Koupdle and vice-versa for four days a week to distribute Sajha Khaja in Pragati School. On top of everything, she does this work whole heartily. KG appreciates her commitment towards the program and extends the gratitude for helping KG live its mission of enabling ordinary people be the change. 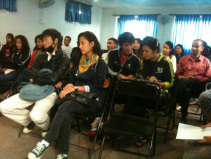 KG organized an outreach in Thames College with the students of social work on September 11. The outreach's objective was to promote KG’s value of ‘self responsibility’. The program commenced with the session of ‘introspection of past and present’ by Shreshna Basnet. In this session the students were asked to contemplate about the simplicity of past and slowly reflect about the situation at present. The students traveled freely in their imagination about what life used to be and what it is now, which helped them to realize about their responsibility towards themselves and the community where they live. After that session, Samjhana and Umanga talked about KG and its projects. Kreeti Shrestha informed the students about how she came in contact with KG and her plans of career counseling that she is going to start with KG. Reecha Nakarmi shared her experience of volunteering in KG with the students. Then after, the team of Maya Universe Academy talked about their initiative of educating children across Nepal with 100% scholarship. They also informed the students about the volunteering opportunity in their school. 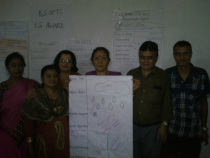 The session was concluded with the sharing of feedback and suggestion with KG Team. KG will be conducting more outreach program in coming days. Network Meeting was conducted with the school teachers from ESN circle of KG in Shanti Nikunja School on September 28th. The meeting was attended by 26 school teachers and 5 KG Teams. 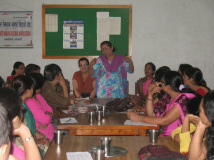 The objectives of the meeting were to inform the teachers about the new program of KG i.e. KG Awards and KG Gifts and to pledge their participation in the program. The meeting was divided into two sections where in the first section the teachers were informed about the program by Mr. Deepak Chaulagain and Mrs Neema Rajbhandari, who are also the jury of KG Awards. In the second section, there was a discussion related to the role of the teacher in the program, the challenges of the program and the action planning by the teachers in the small group. The focus of the program was to instigate teachers’ interest in the program. One of the best finding in the program was that the teachers are not motivated by the monetary incentives but rather are encouraged by the support that their students receive. The program concluded with the formation of 4 small groups by the teachers and their mutual confirmation to meet in KG on October 5 to present their plans about the program. KG Outreach at Thames College. ESN Meeting for KG Awards and KG Gifts. In September, we raised the total amount of Rs. 97,438. Total contributors for this month are 25. Sajha Khaja: This month Sajha Khaja was given to 12 students in Pragati School for 18 days. Sajha Sikshya: Teachers of ESN circle were given the review of the notebook distribution in the Network meeting for KG Awards and KG Gifts. KG Awards: By the end of September Nishan Rai from Shanti Shikshya School has received 75 votes while Sunita Sodari from Pragati School has received 22 votes. The winner will be announced on October 12 in KG’s website. KG Gifts: Mr. Parmesh Joshi has pledged to fulfill the wishes of Laxmi Shahi from Krishna Mandir School, who wanted to get support for her education since her parents are unable to afford her education. 1. KG looks forward for the outreach. 2. KG extends its wishes on the occasion of Dashain to all its community members.